Grill up a couple of beer-marinated pork tenderloins for your next BBQ. The sweet yet tangy marinade keeps the pork moist and flavorful. Top it with a colorful, smoky, charred corn relish for an easy, delicious way to feed a crowd. Grilling season just got a whole lot more delicious with this Beer Marinated Pork Tenderloin, which is so tender and juicy, it practically melts in your mouth. The Charred Corn-Cheddar Relish takes the flavor of the pork over the top. This is bound to become a go-to recipe for the grill master in your household. WHISK together marinade ingredients; pour into large plastic zip-close bag and add pork tenderloins, turning to coat. Let marinate in refrigerator for 8 hours or overnight. REMOVE tenderloins from marinade, shaking off excess. Preheat one side of gas grill or prepare coals on one side of charcoal grill (high heat). When hot, place tenderloins directly over heat, turning ¼ turn until browned on all 4 sides, 2 to 3 minutes per side. TRANSFER Tenderloins to indirect portion of grill; close lid of grill or tent with heavy foil or inverted foil roasting pan and continue cooking until only slightly pink in center and 145°F on instant-read thermometer inserted in thickest part, 3 to 5 minutes longer. Remove from grill and let rest for 5 minutes for juices to settle. 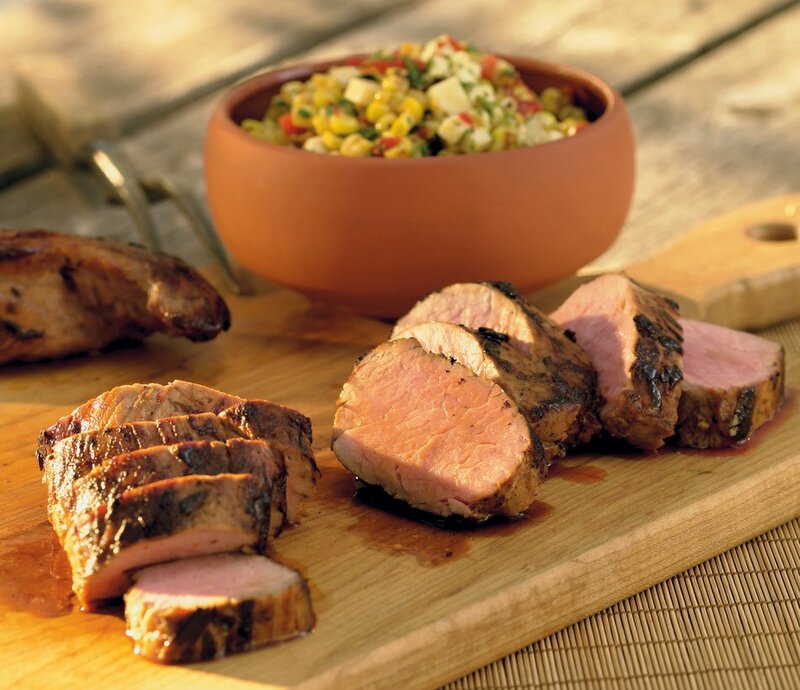 Cut tenderloin into thick slices and serve with Charred Corn-Cheddar Relish. PLACE large nonstick or cast-iron skillet over high heat. When skillet is hot, add corn and cook, stirring occasionally, until corn is nicely browned, about 2 minutes (be prepared for some to pop out of skillet). TRANSFER corn to bowl. When cool, add remaining ingredients and combine well. Serve spooned on top of sliced pork. I bought the cookbook on the basis of how this recipe turned out and how much everyone loved it. This marinade is absolutely delicious! Try it you will love it. I bet chicken would work too. Corn relish is just icing on the cake also wonderful. The next day this makes a great combination for a wrap or a salad. May try with brown sugar vs. maple syrup to cut cost??? but it is great as is!